QT Sydney Reservations. Call 020 7962 9933. Combine a stay in one of the hippest hotels in Sydney with a week on the tropical white sands of the Cook Islands. Beginning with 5 nights at the quirky QT Sydney, you'll have the shops, bars and beaches of this iconic city on your doorstep. Then a short flight will whisk you to sun-drenched Raratonga for the clearest seas you've ever seen and pristine palm-lined beaches. The 5 star Crown Beach Resort features a spa, stunning sheltered beach with snorkelling lagoon, 3 restaurants and spacious bedrooms with cooling tiles and private outdoor decking, perfect for a relaxing week in the sun. Enjoy some of Sydney and New South Wales’ quirkiest accommodation on this 11 night trip staying in boutique hotels with a touch of glamping along the way. 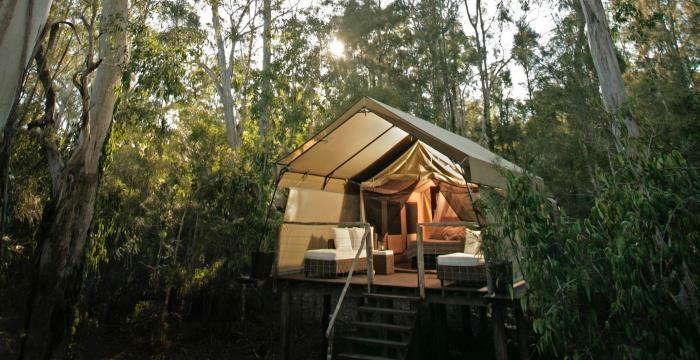 Highlights include 3 nights at the trendy Establishment Hotel then 2 nights in a safari tent at Paperbark Camp in Jervis Bay before heading to Batemans Bay and Merimbula where you’ll stay in Robyn’s Nest. Finish your adventure with a boutique stay at Peppers Manor House in Suttons Forest. Car hire and flights included. Sydney’s quirky QT Hotel provides a completely unique experience, with luxurious rooms and a modern design that makes a nod to the past, set within the historic Gowings and State theatre buildings. This boutique property retains many of the buildings’ most distinctive features, with a blend of Gothic, Art Deco and Italianate architecture that forms the unmissable exterior in the heart of the central business district. Therapists at Spa Q have been trained to deliver the highest level of pampering experiences, carried out using two exclusive product ranges. Immerse yourself in the Hammam-inspired steam and ice room, then enjoy the treatment of your choice, from massages, facial therapies and body exfoliation and masks to hair styling, manicures and waxing. Whatever you need to relax, the spa at the QT Hotel Sydney has it all. With a contemporary and unique design, all 200 guest rooms at QT Sydney feature luxurious bedding, high-speed internet access, flat screen HD TV, designer furnishings and large bathrooms with walk-in showers. Most suites also offer an indulgent oversized soaking tub, as well as an increased overall level of indulgence. Set in the heart of the city, the QT Hotel Sydney is close to all the action, from great entertainment and nightlife to restaurants, bars, shops and theatres. The hotel is the ideal place to relax or dine after a day of sightseeing, which can be arranged by the concierge, and it offers valet car-parking as well as 24-hour room service. Open for breakfast, lunch and dinner, Gowings Bar & Grill is a European-style brasserie with a contemporary design. Offering the freshest Australian produce prepared in wood-fired rotisseries and ovens, it also features a specially curated wine list. Parlour Lane Roasters is a bustling street-side café perfect for morning coffees and afternoon aperitifs, while the Gilt Lounge at the QT Hotel Sydney is a late-night bar and club with an extensive cocktail list for exclusive clientele.